The DPS Archives used to contain the oldest report I'm aware of that mentions me, but it has since been deleted there after being re-posted on Climber.Org with permission of the author. 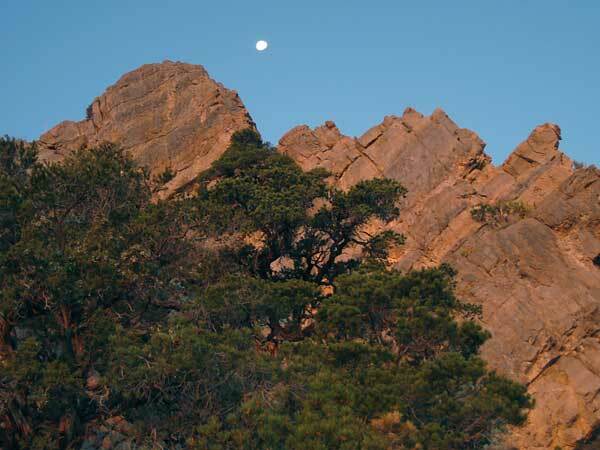 One of the two "lost" people in that report was me, and we signed out because she wasn't confident on bad terrain... so we hung out and watched the moon rise, then walked back to the car by moonlight. The DPS report leaves out important details, so I'll complete the record here: As we were returning, I noticed activity at the ranger station when we returned, so I sent her back to the car while I went to ask the ranger if he needed help with the search. After asking me a few questions, he quickly realized he was looking for me, except I wasn't the unequipped novice that I had been reported to be. The DPS had reported us with no gear and no experience, even though I told the leader we planned to return after dark and showed him my pack's contents (Angeles Chapter 10 Essentials!) and my headlamp (not a common item back then). Oh, well. When I got it all straightened out and went to my car, the group was indeed having a good time around a fire, but my friend was in tears having been told she had ruined the trip for everyone. Not so! They got both peaks and we had a nice tour of Mitchell Caverns. This year, when I finally got around to going back for the peaks, I didn't want to spend two days and I didn't have a 4WD. Many reports suggest the ranger won't always give you a key to reach the Gilroy Canyon trailhead, so I looked at the map for alternatives. See the trailhead page and the map below. 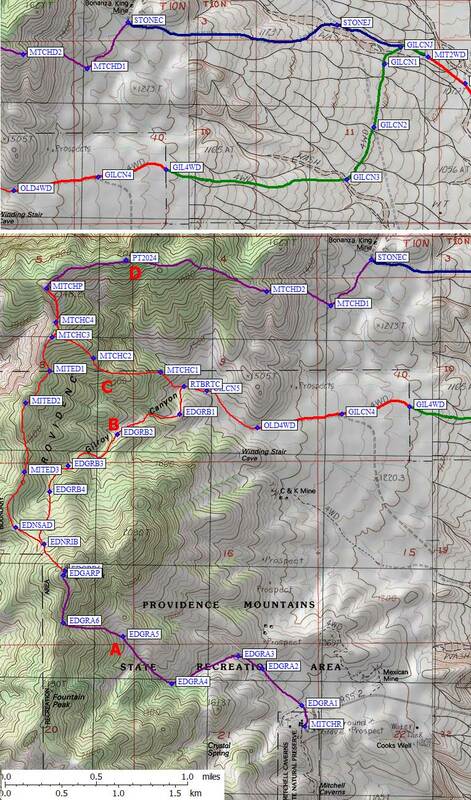 I think there is a better way than the DPS Guide to approach these two peaks for a one-day loop. This time I had a good plan for the trip: It was a little hot in the afternoon, so I didn't want to hike then. By having an early dinner at the car and tanking up on fluids while waiting until the sun went behind the mountains, I could walk comfortably and use less water. In addition, I would carry far less weight than if I had all the stuff for dinner. The moon was just past full (yep, almost a full moon, almost like before) so I could leave early and still navigate. If the day got too long, at least I'll be back in the canyon before dark, spending most of my late time on a road. I was psyched. I walked away from my car around 5pm, around dusk. Since it gets dark very early in November, why not take a sunset walk? What else are you going to do after 5pm? Cross country here is very easy but the road is still more efficient. See the trailhead page for a description of the 2 miles of 4WD road I hiked up before camping in the wash just beyond the old trailhead (waypoint OLD4WD). It took about 1.5 hours to get to camp since I wasn't hurrying, and part of that was done by headlamp. The stars were great, the insects were singing, and Vegas looked radioactive! The next morning I left camp at 430am, NOT using a headlamp! The moon was still very bright and directly overhead pre-dawn, just as planned. In spite of that, it was somewhat disorienting to be walking up a braided wash solo at night. I turned left into the wash which starts at 4600' (waypoint GILCN5), going west in the drainage just north of Point 1512. I climbed out to the right (north) side of the canyon starting at 4700' (waypoint RTBRTC), before the canyon turned south. I think this is the junction of the DPS Guide's Route B and Route C.
I continued west, climbing slowly until I found some limestone ledges that led up and right to the ridge. Finally above the brush, cholla, and cat's claw, all I had to contend with were a few prickly pears and the occasional agave. Not at all the horrible terrain I'd expected from the Route D trip reports! I didn't get stuck, even walking by moonlight. Once on the ridge, the low-lying cactus gives way to pine trees but the footing is still mostly harsh limestone which really wants to tear you up if you slip. At 5400' the ridge gets much harder, but I kept it mostly Class 2. I avoided some of the small rock faces by going around, mostly on the left, but chose to go over a couple of them to avoid losing altitude. The DPS Guide says to leave this ridge at 1700m, but unless I was completely on the wrong ridge, that's not possible. There's a gorge and cliffs to the right of the ridge here, so I just stayed on the ridge crest. Oh, well. Above 1700m the walking was particularly nice for a bit, but then got tougher again. At 6000' (waypoint MTCHC2), I tried again to figure out how or why anyone would leave the ridge. Here it was nice limestone base rock and a few aesthetic knife edges. There's no need, and no place, to really leave the ridge. The map doesn't accurately show the baserock flat (but not level!) slope to the left or the cliff to the right. The northeast cliff seemed unlikely to provide an easy traverse, so I stayed on the ridge which tops out on the 2020m bump (waypoint MTCHC3, 6600') directly south of Mitchell. It's 150' down to the Mitchell saddle (MTCHC4) but that's a small price to pay compared to the ugly sidehill you'd face if you left the ridge sooner. I arrived on the summit of Mitchell at 815am, mid-60s, slight breeze. Nice! My cell phone worked, so I updated my "flight plan" with Stella and had breakfast. Half an hour later I was picking my way down that sharp rock and heading for Edgar. Back to the bump (waypoint MTCHC3) at 920am I collected the water I had left and headed south. 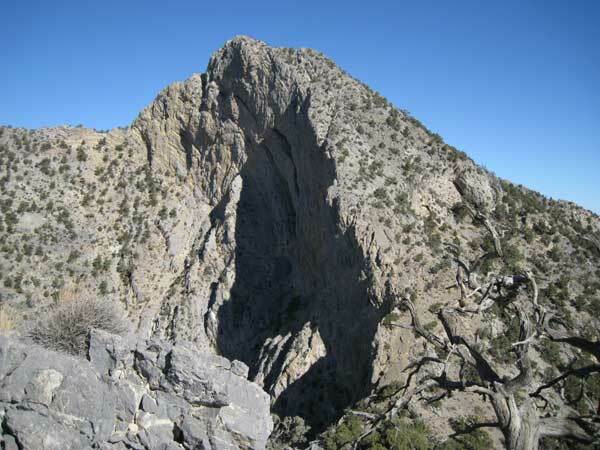 At the next saddle, I dropped southeast from the saddle to 6300' (waypoint MITED1, the real start of the traverse from Mitchell to Edgar) where I climbed 5' of class 3 to get through a cliff band. This might be hard to figure out going the other direction (looking over the cliff, instead of up at it). I immediately climbed 50' to go through another band of cliffs, then angled another 50' up to the ridge. I crossed to the right (west) side of the ridge for the first time at a minor saddle (waypoint MITED2). Before that I was on top or to the left. This is a great place for a rest break. Big shade trees and a good view of Kelso Dunes. Judging from the coyote dung, they like it too! Staying on the right-side animal trail, hold altitude until you hit the ridge (still at 6400'), follow that down to a 6200' saddle, over a bump, and down to almost 6100' (waypoint MITED3) which is the low point of the ridge traverse between the peaks. I stayed on or near the ridge from there to the base of Edgar (waypoint EDNSAD), the big saddle north of the peak (just below 6300'). It's an extra hundred feet of up and down, I suppose, but still faster than up and down around obstacles on a sidehill. It's easy to drift one way or the other when climbing Edgar. I think the best route is to climb the left (east) side of the ridge, making sure to stay left (east) of the rib above 6450' (waypoint EDNRIB). The 2000m contour (6600', above waypoint EDNRIB) is the base of the correct summit chute. Below that it's rocky, steep, and disorganized. Stay in the chute or you'll end up crossing back into it just below 6900'. You'll climb through a boulder field of purple rocks, which is steep but pretty good footing. Near the top of this chute there are lots of trees and bushes. I went to the easiest-looking (left) saddle, which was too far north. The correct saddle is only 50 yards from the summit (waypoint EDGRB5), and it's a class 2-3 scramble from there. It was only noon when I got to Edgar (waypoint EDGARP), but it felt like a long day because I had been climbing for almost 8 hours already. I stayed on top for an hour relishing having bagged both of them without a 4WD vehicle, then started to wonder if I'd get all the way back to my car before dark. It's worth noting that there is a good cell phone signal (Verizon) along the entire ridge, but not in the canyon or where I parked (MIT2WD). It's also worth noting that Edgar Peak used to be called Providence Mtn by the DPS. A USGS geologist (the only person I met on this climb) told me what we now call Edgar used to be called Fountain, and what we now call Mitchell used to be called Edgar. Go figure. Rather than descending all the way to the saddle (EDSADN), I turned northeast below the rib, following a nice purple sandy gully into the trees and avoiding all the cliffs. There are occasional and minor tough spots in the drainage, all of which are fairly easy to bypass. At 5800' (waypoint EDGRB4) I popped out of some trees and into a larger drainage. On the way up this drainage junction would be very hard to find, but it's critical to turn south here on the way in! Continuing southwest would put you at the base of cliffs. This junction defines the line between great walking and weaving around brush, trees, boulders, and cactus. It's not super hard from here down, but from the ridge down to here had been the best walking of the entire day and it was sad to see it end. At 5600' the drainage turns and I stayed way up the north side, going over a side rib (waypoint EDGRB3), a good place to sidehill around a lot of drainage detritus when climbing or descending. At 5300' there is another vague drainage choice, where you would stay right on the way in. At 5150' there's another canyon branch that would be a left fork on the way up (EDGRB2). It sure is easier to follow a drainage DOWN than UP! 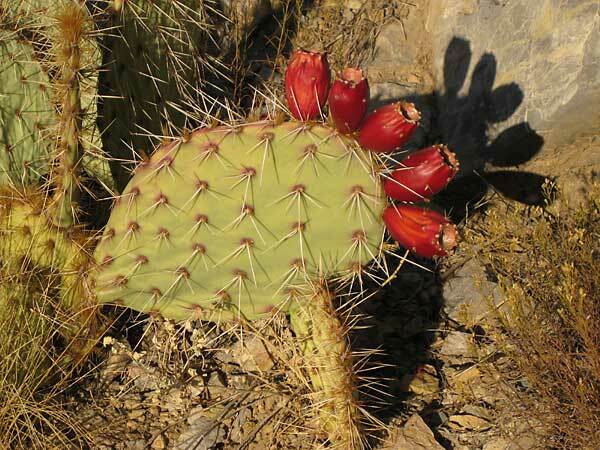 Below this junction there are a lot more cactus, including prickly pear loaded with fruit. There is a major fork at 4900' on the way up, where climbers would bear left. Below this the drainage skirts the cliffs on the west side of Point 1512, doing a U-turn and joining Route B on the north side of Point 1512 (RTBRTC, 4700'). If you reverse my route, be sure to bear left at 4900' (waypoint EDGRB1) after passing those cliffs. At 4600' (waypoint GILCN5) I re-joined the main wash which drains the south face of Mitchell, turning southwest back to the old trailhead (OLD4WD) and easier walking. Back to my pack at 320p, back to the car at 445p, I had time to clean up and have a beer before dark even though it was a 12 hour day in November. Trip totals: Around 12 miles of walking (ignoring the "squiggle factor" for all the brush, which at times was 2x), and about 4800' of gain (not counting all the little ups and downs, which might add a few hundred feet more).